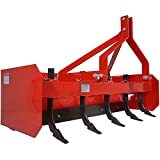 Garden tractor box blades are one of the most common garden tractor attachments there is and with good reason. Garden tractor box blades can be used for a number of different types of jobs making them very versatile. 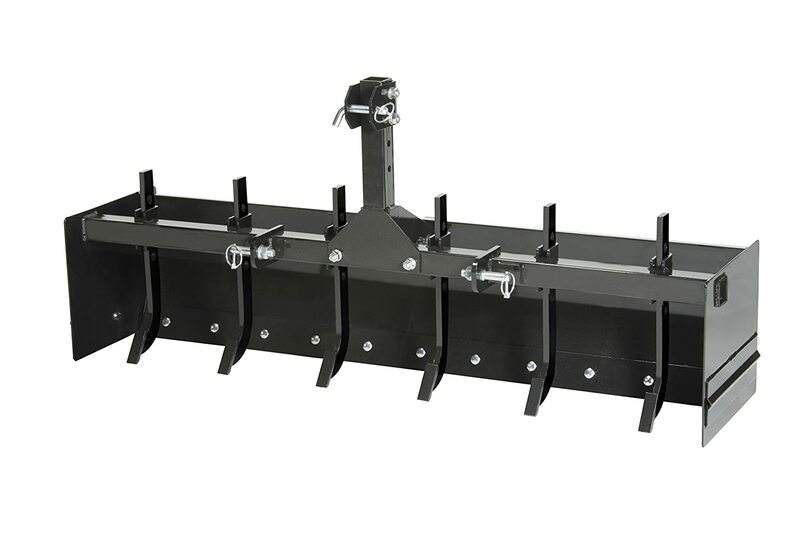 If designed right a box blade can be a combination of 3 different attachments, a forward and backward scrape blade, a scarifier bar, and a hopper box. Some people even use it as a tiller/plow. Now I’m not saying that a box blade is better than a scraper blade or better than a scarifier. You need to look at the big picture and see what you want to accomplish now and in the future. If scrapping snow off your driveway is your main and only reason then a scraper blade would make a better choice. On the other hand, if you plan on doing some garden and yard work along with scraping your drive, then a box blade would make more sense. The real question is what can’t you do with a garden tractor box blade? I know it’s not the perfect attachment for everything, but it’s pretty good at a lot of things. Those are just a few I could think of off the top of my head, and I’m sure you already have a few in mind. Garden tractor box blades get a lot of abuse pulling and pushing stuff around, and you need to make sure what every box blade you get has a good quality build. Solid welds and a sturdy steel frame is what makes a right box blade great. Another thing to consider is the type of hinge and hows it’s made. You want to make sure things don’t break the first root you get snagged on while scrapping the ground. Another thing to look at is the way the shanks insert into the box blade. I’ve seen them where metal plates hold them, and a pin and those tend to wear out fast. The better builds have slots cut out in the metal tube for the shanks to slide into which gives them a lot more support. When buying a box blade make it’s a good idea that the width of the box blade slightly exceeds the outside diameter of your tractors back tires. Also make sure you scrape blades are removable, reversible, and if possible have offset slots. While most don’t have them reinforced plating on the side walls is also a nice extra touch. These things are heavy so be sure to factor in shipping costs. Note that because of the weight and size most box blades won’t ship directly to a residential address and will need to be picked up at a nearby shipping terminal. 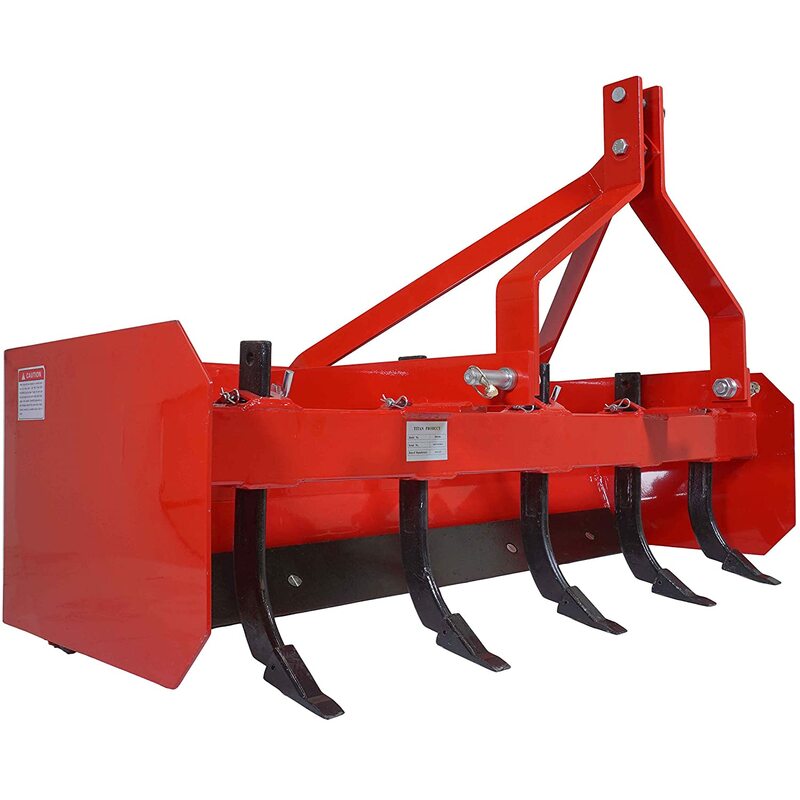 Here are a few of our top choices for compact and subcompact tractor box blades. EA XTreme Duty Compact Tractor Box Blade by Everything Attachments is a top contender. 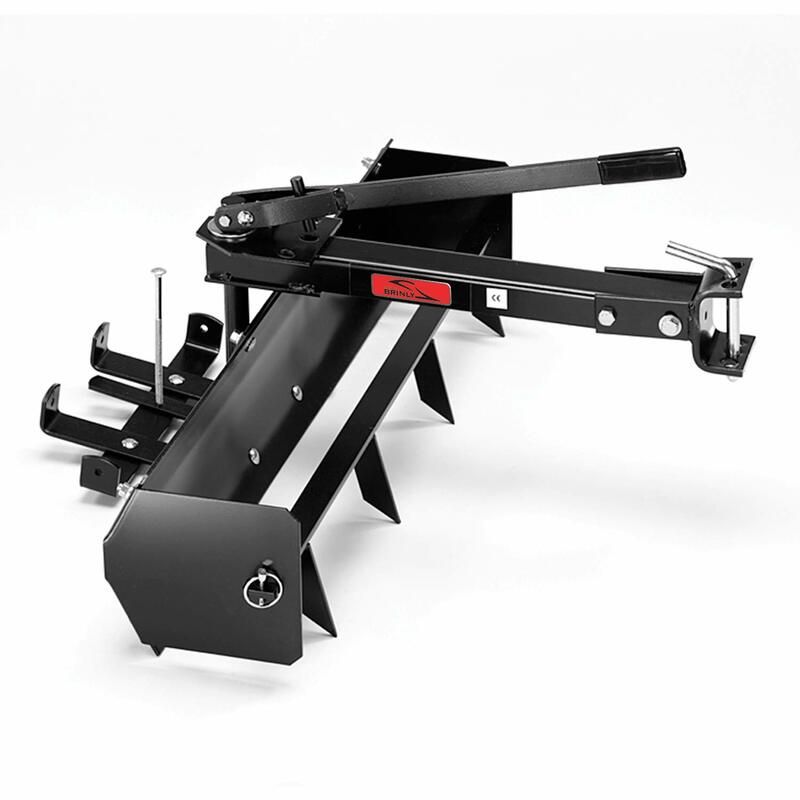 It’s rated for up to 35hp subcompact or compact tractors with a category I quick hitch. Made in the US which is a plus in our book. The side plates are 1/4 inch thick and have extra plates on the leader edges for even more durability. As if that wasn’t enough they also added horseshoe-shaped plates welded under the tube behind the bottom of the ripper shanks to strengthen the machine which helps prevent piercing. Another bonus feature is the scarifiers have replaceable tips. Truly a great deal. Delighted customers are mentioning how it performs flawlessly and how it’s very well built. The Titan Box Blade Tractor Attachment is another excellent attachment from Titan. With a heavy duty build 4″x4″ square tubing shank for support and 6.25mm side panels. That’s a tad thinner than the XTreme Duty but still a suitable thickness. Perfect for light duty ripping, finish grading, and back-filling. Includes two reversible and replaceable curved, hardened steel cutting edges and five scarifier shanks. I don’t think these shanks have replaceable tips but should be strong enough to last a good while. Only customer complaint was about missing parts. Overall the customers were delighted. The Land Shark Subcompact Tractor Box Blade is another attachment by Everything Attachments. It’s not quite as good as the XTreme Duty version, but it’s also a bit cheaper. This version only comes in 48 & 54-inch widths, so it’s more rated for subcompact tractors. Uses the same type of adjustable ripper shanks with replaceable tips. Also includes the extra plates of steel welded to the leading edges. You’ll get no complaints with this box blade either. They offer free shipping within the first 1000 miles as well. There are not many lawnmower box blades mainly because lawnmowers don’t have the horsepower to pull them. Box blades typically weight a lot on to of that they need pulling and pushing power. If you have a heavy duty lawnmower with a 3 point quick hitch and enough horsepower you might be able to use the Land Shark Box Blade. We did find one that seems pretty decent and got a good number of positive comments for the average lawnmowers. At only 38 inches wide the Brinly BS-38BH Box Scraper is a perfect size for lawnmowers. It does require a sleeve hitch which is not included. Because of its lightweight frame, it’s got a built-in weight tray on the back sized for cinder blocks. One thing this box blades that none of the others do is allows for 30-degree angles. This is when you want to use it as a scraper blade. It’s by no means as durable as a tractor box blade, but it’s not half bad. Most customers are relatively satisfied and comment on how it’s great for small jobs such as moving sand and leveling small drives. I’m sure it would even be pretty good for light snow removal or maybe light garden work. Impact Implements CAT-0 Box Scraper is created for rugged use by landscapers, farmers, and homeowners. Box scrapers are great for grading, landscaping, land leveling, backfilling, and many other projects. Height adjustable, heavy-duty shanks with replaceable steel cutting edges break up hard ground. Apply down pressure for customized cutting and leveling capabilities. Attaches to CAT-0 Systems with the included pins. Do you already have a box blade or planning on getting one? What do you use it for or plan on using it for? Help us improve the site by sharing your thoughts and suggestions in the comments below.